Present projections of climate change scenario show an increase in global temperature and CO2 content, which have indirect impacts on surface water flow, but rainfall has direct impacts on surface run-off and groundwater storage system. 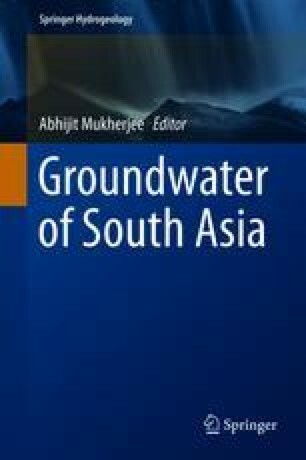 This study investigates the effect of climate change on aquifer storage and surface run-off, and interactions with the river Bhagirathi-Hooghly, the lowermost reach of Ganges River in Indian state of West Bengal, by considering changes in rainfall events from 1999 to 2013. From time series analyses, it has been shown that there is a linear decreasing trend of rainfall in the selected study area in Nadia district of West Bengal. It has been shown that baseflow to the river has an inverse relation with rainfall, which indicates that higher rainfall events relate to the low baseflow and lower rainfall will relate to the higher baseflow with a correlation coefficient of −0.74. The direct effect of climate change induced through precipitation indicates that the total run-off in the river is decreasing with time which causes stresses on groundwater.